If there is a game there are grades. In reality it's a little harder to unpack a scrimmage because -if we're being honest- it's kind of meaningless when it comes to assessing overall quality. The offense is watered down, the defense isn't overly complex and nobody is trying to hit their teammate into next week. So, this isn't about making a big deal out of mistakes, because that's what happens when you let everyone on the team take the field. Nevertheless, there are still good things to take out of Saturday afternoon's glimpse into the future. But again, grains of salt. This time around there won't actually be grades, because so many things change over the span of a spring scrimmage that you aren't even grading the same people any given drive. So instead, it's insight and a few thoughts. If you wanted to leave Saturday with a strong impression about Sean Clifford in any direction you probably didn't get that. He was solid, going 11-of-19 with at least two drops early, but was otherwise not overly impressive from the standpoint of everyone going "wow" and leaving with new expectations. He seemed comfortable in the pocket, although he also seemed happy to run sooner, rather than later. All told though, he appeared to give off all the same hallmarks of a potential starting quarterback you would want to see in April. Elsewhere Noah Cain was very impressive out of the backfield on an afternoon most fans were expecting to see Ricky Slade and Journey Brown. It's hard to know where Cain will fall in the rotation, but he certainly looked the part. Penn State's offensive line also seemed to take care of any given quarterback. Spring ball rules don't always give the line much help, but if you were worried about seeing quarterbacks running for their lives, you didn't. Michael Johnson Jr and Ta'Quan Roberson were both comfortable with their time on the field at quarterback, neither doing much in the way of impressive work, but neither making massive mistakes either. Will Levis' 59-yard bomb was the best pass of the day. As for wideouts, a few early drops sent a handful of groans through the crowd, but the leveled out just fine. Not many shots down the field, but it isn't that kind of game. A little less to say about this group because so many people saw the field. Micah Parsons did get left hanging in the backfield trying to catch Cain but that'll happen. Meanwhile Brandon Smith made a solid debut with six tackles and Keaton Ellis was solid as well and looks very much the part both in how he plays at corner and his overall size. Defenses held the entire game to 8-of-22 on third down but both offenses were 4-of-4 in the red zone in terms of scoring. This game is slanted to put good on bad, so Penn State's first team beating its second team defense is kind of the point. Not going to make too much of this one. That being said, the young guys looked good. 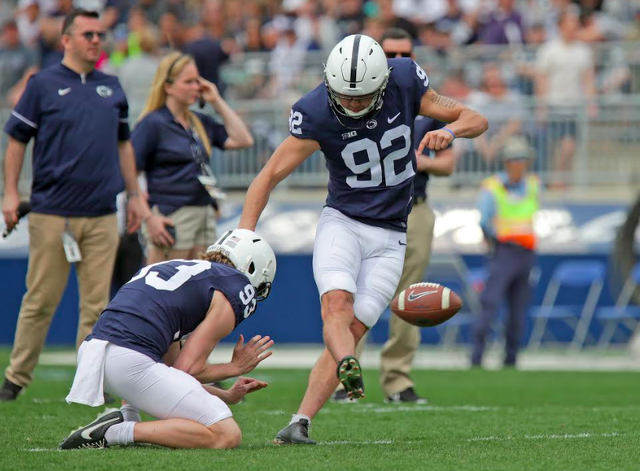 Blake Gillikin had a nice afternoon averaging just over 42 yards per punt, and all of the field goal kickers seemed solid during their kicking period. It's hard to have an opinion of a unit that doesn't really do anything during the scrimmage but for as bad as special teams was in 2018, seeing punts go in the right direction and kickoffs going into the end zone is all you can ask for. If you wanted proof Penn State is going to win a national title you didn't get that. If you wanted evidence that the program can survive in a post-Barkley and post-McSorley world, there was enough good to take home this summer and feel confident about. There will be plenty of questions left to answer this fall, but Saturday was a confident step. 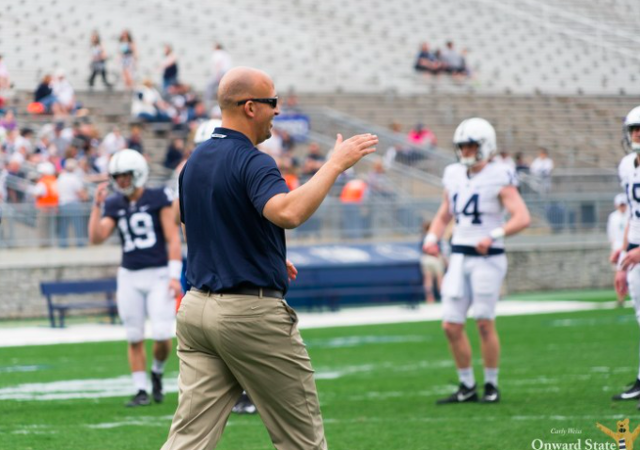 Penn State football picked up two verbal commitments during Blue White weekend when four-star defensive tackle Cole Brevard and three-star offensive lineman RJ Adam made their decision on Saturday evening.